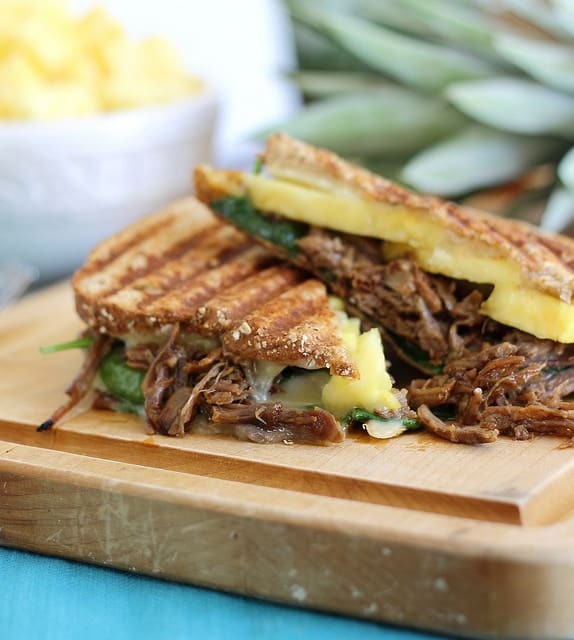 This carnitas pineapple panini is made with the meat from the Pioneer Woman’s Carnitas Pizza. Mouthwatering in every bite. If yesterday’s carnitas pizza didn’t convince you that you need to try out the meat in that recipe, today’s post will. Unless you’re a vegetarian, in which case you’ve probably already exited out of here. Sorry, come back tomorrow, I have alcohol for you! In my pineapple soaked meat induced haze, there was only one thing to be done with the leftover carnitas. Paninify it with more pineapple and cheddar cheese. This would be my 5% for last week and while I usually reserve such occasions for chocolate, there was no beating this greasy deliciousness. It’s messy, sweet & savory with the perfect contrast of crispy chewy bread on the outside to soft, melt in your mouth carnitas on the inside. As I stood over the counter eating this (because waiting a second longer to get from the panini maker to the table was unthinkable) all I could think about was how this would be an awesome contender for that Guy Fieri show Diners, Drive-ins and Dives. That’s something I never thought I’d say in reference to food on here, but there it is. Embrace it. Do you want to know how nice of a person I am? I’ll tell you. I shared this. I only ate half and saved the other one for Ulysses. It might’ve been his birthday and I might not have been so nice the other 364 days of the year. 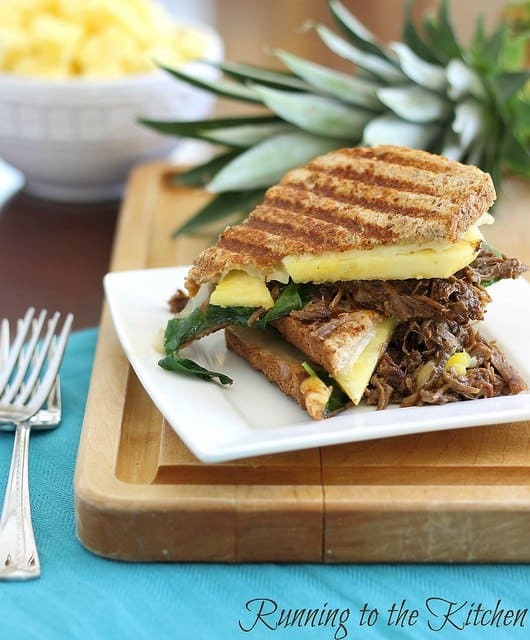 This carnitas pineapple panini is made with the meat from the Pioneer Woman's Carnitas Pizza. Mouthwatering in every bite. Preheat panini griddle to medium-high or, if doing stop top, heat a skillet or griddle to medium high. Spread butter on one side of each piece of bread. Flip the bread over and layer cheese on both pieces. Next lay the pineapple rings on one piece of bread and then the meat on top of that. Finish with a handful of baby spinach on the piece of bread with just the cheese and flip that piece on top of the other to make a sandwich. Transfer to panini maker or skillet and press for about 3-5 minutes until cheese is sufficiently melted and oozing. Slice and half and enjoy warm. OMGGGG. 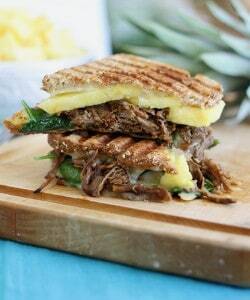 I never EVER thought to put pineapple in a panini!! I am totally going to try this with a grilled cheese, I think that would be AMAZING with the pineapple!!! This is so perfect for leftovers. Love the pineapple with the pork. So, so good! The leftovers were so good. Smart of you to do a post with what was left! I meant to but we always ate it when the light wasn’t ideal. Awesome, awesome way to use leftovers. Sweet and savory is the best combination. I’ve never been a big fan of the pineapple/ham Hawaiian pizza but for some reason this panini idea seems sooo delicious. Now I could totally get behind this baby!! The carnitas themselves rocked and I have a feeling that in panini form it would totally rock my socks off. Thank you! coming from you, that means a lot as your pictures are constantly amazing! Oh my gosh! This is a wonderful recipe! I love sandwiches and this one is perfect!! Nice of you to share, I wouldn’t of! Yum! This looks absolutely delicious! Gorgeous photos! You are nice. Anything that includes pineapple would never leave the grips of my hands. you’re a saint for sharing that ;) it looks amazing. This just looks fabulous. I think my 5% is going out of the window this weekend. With Cinco de Mayo, and my husbands birthday yesterday, celebration for which has been pushed to the weekend on account of him being out of town. And this. I better do my end of LiveFit Phase I measurements tomorrow morning. And maybe not step on that scale for couple days after that. That cardio on Monday will be very welcome. Now I need to go buy me some beef.